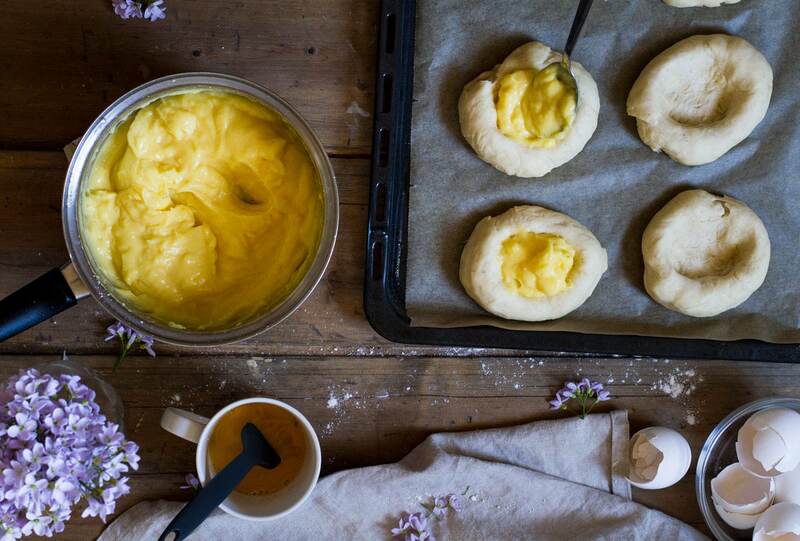 Vanilla custard and coconut sweet buns – taking everything to the next level. 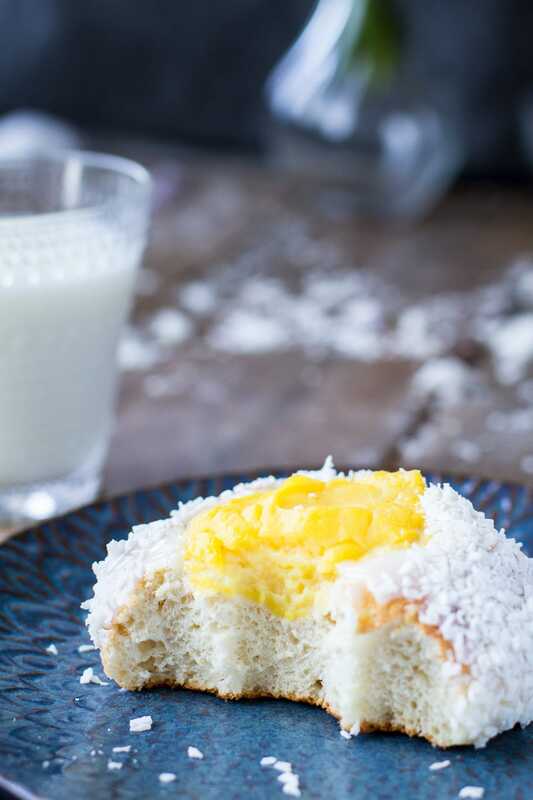 Sweet, fluffy and moist sweet buns with a woody and creamy vanilla custard center, drizzled in a thin layer of sugar frosting and shredded coconut – it has it all, and you’ll be sorry if you don’t try it. 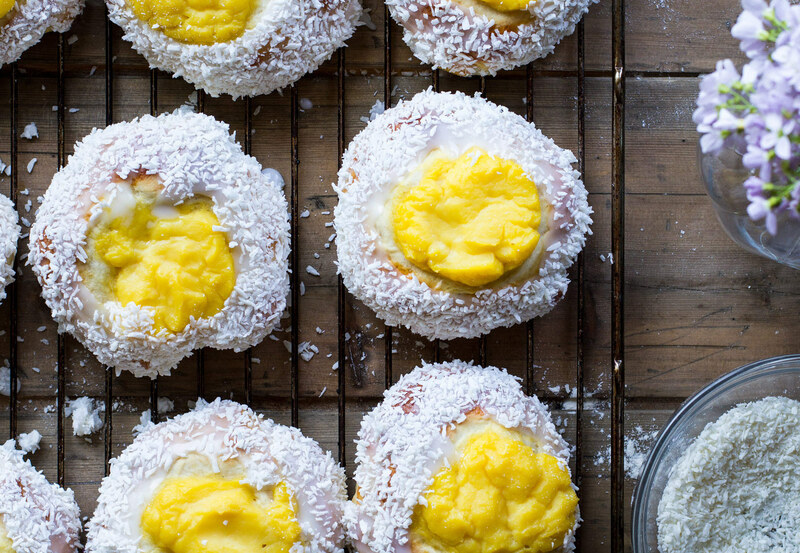 Vanilla custard and coconut sweet buns has been a Norwegian tradition since WWII. Many people struggled feeding their children enough, so the schools decided to make these buns in order to get the children to eat. That is why they are called Skoleboller, which translates to school buns. Fortunately, they turned out to be the best thing ever. 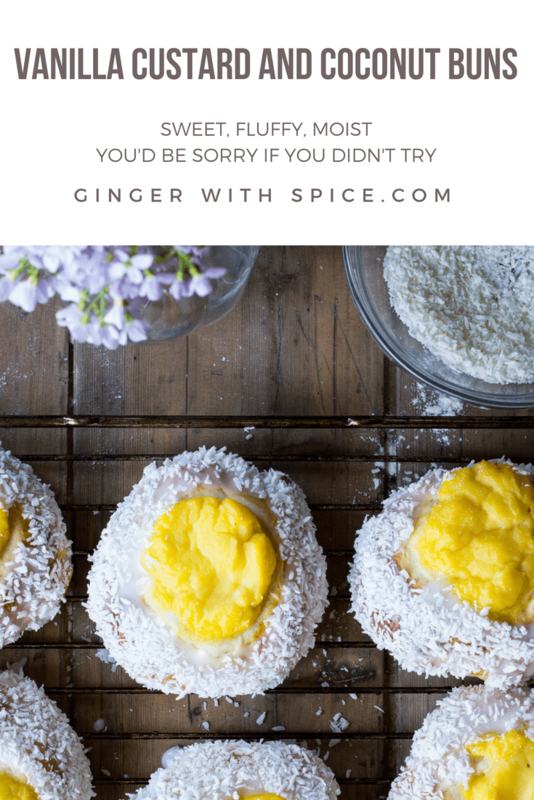 I’ve thought about uploading this recipe since the beginning of Ginger with Spice’s story. The vanilla custard and coconut sweet buns are made every so often in this household, along with cinnamon rolls. The recipes have stayed the same for years, and there’s a reason for that – they’re perfect. 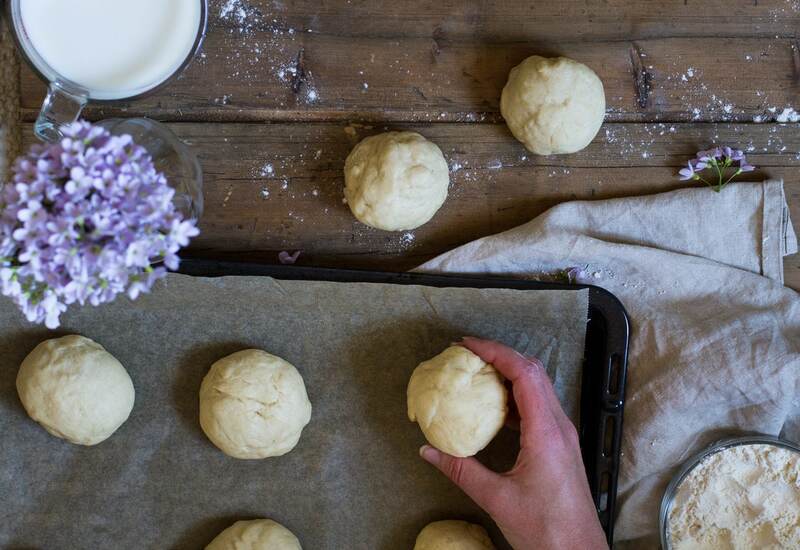 The sweet buns are made just like this base recipe. The difference comes after step 6 in that recipe. Cover with a towel and let rise for about 40 more minutes. And when that’s done, make a hollow in each one. It should be large enough to fill 1 tbsp of vanilla custard. The reason why I have waited so long with sharing this recipe is because of the vanilla custard. I have always made these with a half finished vanilla custard (powder form), and this is because it works like a charm. I use two packets of these Freia vaniljesaus til koking along with 4 tbsp sugar, 1/2 liter of milk and 2 eggs. Pour everything into a saucepan and whisk until incorporated. You want medium heat, enough for it to start bubbling eventually. Whisk constantly, and when it begins to thicken, place the saucepan in cold water for it to cool quicker. As most of my lovely readers are not from Norway, I couldn’t just provide that option. But I promise, it’s a good option, and I’ll continue to use it. But a few weeks back I made Turtle Cakes (Skilpaddekaker) and then I had to make up a rum cream, and the base – you guessed it – a vanilla custard! Right, so finally I had a homemade vanilla custard to show for. Pour the milk, half of the heavy cream and half of the sugar into a saucepan. Cut open and scrape out the seeds of the vanilla bean . Place everything into the saucepan. Heat up to the point of boiling, constantly stirring. In another bowl, whisk together the rest of the heavy cream, egg yolks, cornstarch and the rest of the sugar. Cool the milk mixture a little bit before slowly pouring it into the egg mixture while constantly whisking. Pour this mixture back into the saucepan, make sure you bring with you the vanilla seeds. Heat the mixture back up, until it is thickening. Remember to stir. Place the saucepan into a tub of cold water to cool. Once the vanilla custard is semi cool to cool, take 1 to 1 heaping tbsp of vanilla custard and place it into one of the hollowed out buns. Continue with the rest. Most likely you’ll have a little leftover custard. Brush each buns with a whisked egg. Bake in the oven at 230C (446F) for around 12 minutes. Cool completely on a cooling rack before continuing. Once the buns are cold, you’re ready for the next step. Pour powdered sugar and a little bit of water in a bowl. Mix until you get a slightly thick frosting. It needs to be pliable, and not so runny that it just slides off the buns. Take a butter knife or a spoon and spread the frosting around on the bun (not over the custard). Before it has a chance to dry, dip the bun into a bowl filled with shredded coconut . You want it evenly covered. Let dry on a cooling rack and continue with the rest. 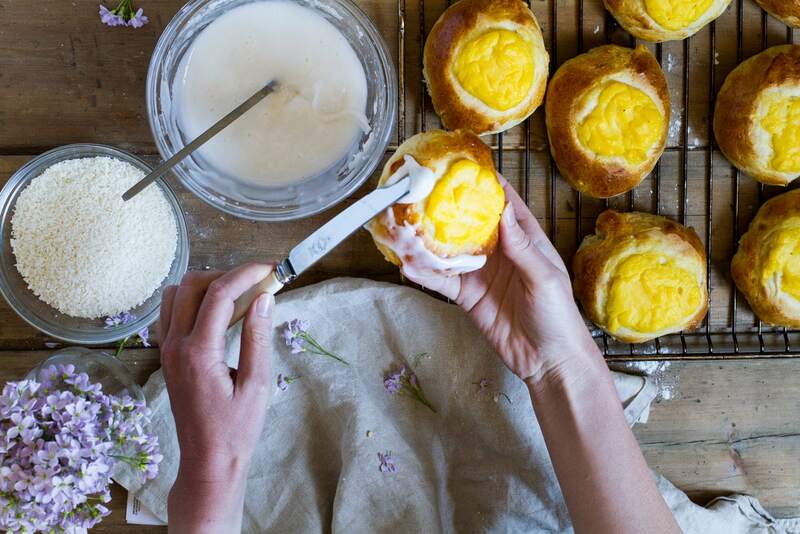 These vanilla custard and coconut sweet buns are nothing like anything else you’ve tasted! They scream comfort food, and are perfectly served with either a glass of milk or with a cup of deliciously hot chocolate. I mean it, I always make one batch thinking – oh no I can’t eat them all. And then they’re all out and I cry because I just didn’t learn from the last time I was out. Just a warning. I’m totally making a double batch the next time. Eat one before you do all the dishes and clean the counter filled with frosting and shredded coconut. ? I’d appreciate any kind of feedback – either in the comment section below or tag me @thegingerwithspice on Instagram. And don’t forget to Pin it for later! 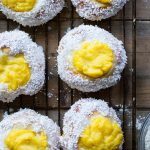 Vanilla custard and coconut sweet buns - sweet, fluffy and moist sweet buns with a woody and creamy vanilla custard center, drizzled in a thin layer of sugar frosting and shredded coconut - it has it all, and you'll be sorry if you don't try it. In a medium saucepan, melt butter, pour the milk in and wait until the mixture is lukewarm. This is very important or else the yeast will not activate. Mine was at 38C (100F). 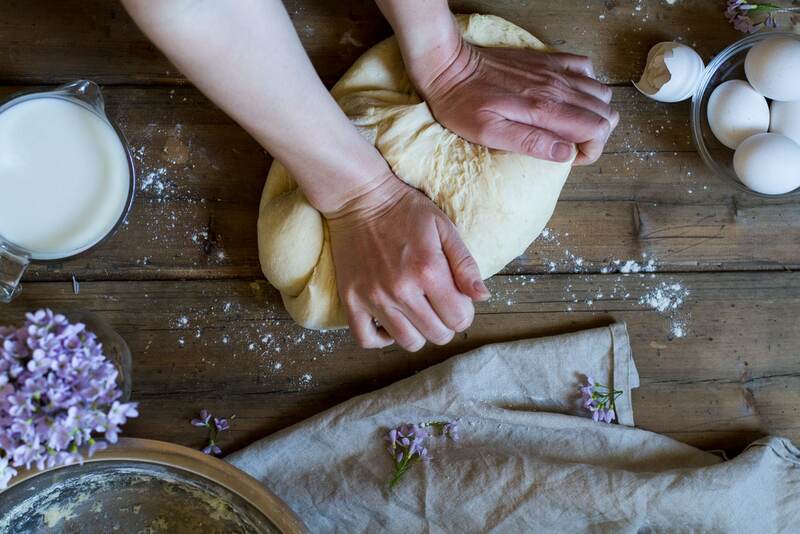 Knead together. If you've got a stand mixer - good for you - otherwise use a hand mixer. This is also a very important step, as you have to mix until the dough is fluffy and no longer clings to the bowl. But, you don't want to add more flour that absolutely necessary, as more flour means denser buns - which you obviously don't want. 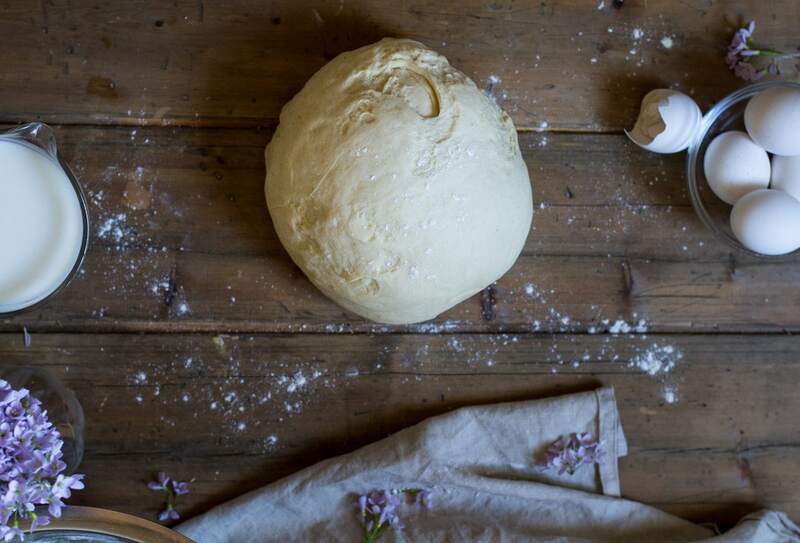 Take the dough onto a lightly floured surface and start to knead a little with your hands and form a long tube of dough. Cut into equal parts, about a handful each. Start to form a ball with your hands and place on a plate with parchment paper. Cover with a towel and let rise for about 40 more minutes (make vanilla custard now). And when that's done, make a hollow in each one. It should be large enough to fill 1 tbsp of vanilla custard. Pour everything into a saucepan and whisk until incorporated. You want medium heat, enough for it to start bubbling eventually. Whisk constantly, and when it begins to thicken, place the saucepan in cold water for it to cool quicker. Pour the milk, half of the heavy cream and half of the sugar into a saucepan. Cut open and scrape out the seeds of the vanilla bean. Place everything into the saucepan. Heat up to the point of boiling, constantly stirring. Pour this mixture back into the saucepan, make sure you bring with you the vanilla seeds. Heat the mixture back up, until it is thickening. Remember to stir. Place the saucepan into a tub of cold water to cool, remove the vanilla beans. Once the vanilla custard is semi cool to cool, take 1 to 1 heaping tbsp of vanilla custard and place it into one of the hollowed out buns. Continue with the rest. Most likely you'll have leftover custard. Brush with egg wash.
Bake in the oven at 230C (446F) for around 9 minutes. Cool completely on a cooling rack before continuing. Once the buns are cold, you're ready for the next step. Pour powdered sugar and a little bit of water in a bowl. Mix until you get a slightly thick frosting. It needs to be pliable, and not so runny that it just slides off the buns. Take a butter knife or a spoon and spread the frosting around on the bun (not over the custard). Before it has a chance to dry, dip the bun into a bowl filled with shredded coconut. You want it evenly covered. Let dry on a cooling rack and continue with the rest. They are definitely best the first day, but delicious for several days. They can be frozen, but the custard often looses a little of the flavor. I can picture it, inviting friends over to have a coffee with me in the garden and serving them these lovely Vanilla Custard and Coconut Sweet Buns . I am sure they would be a hit! They just look too good to be true. I love your images btw, the flowers in the background just make it all so perfect. I have never had any dessert like this before, but I am dying to try it! I love coconut and I love custard so I can only imagine that I would love these! 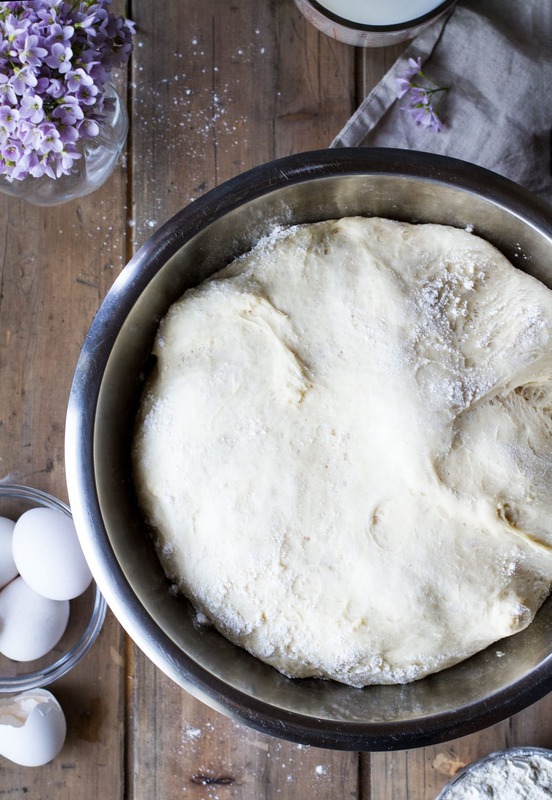 I love making bread so I cannot wait to make this! Oh my, then you will definitely love these! I truly hope you’ll give them a try. Thank you so much, Casey. Looks totally delicious and so beautiful! This would be amazing for spring brunches or Easter/Mother’s Day. Thank you! Yes, I actually do make them every Easter, and any other excuse to make buns really. These look absolutely amazing! I love everything here – the sweet dough, the custard, and the coconut topping! Thank you so much! I hope you get the chance to try them! Omg these are the most cutes buns I have ever seen! I think they are too pretty to eat. I want to make these for breakfast once we are settled into our new place. Can’t wait to try them! Thank you so much, April! Congratulations on your new home, and I hope you’ll like these buns! Thank you so much, sweetie! Yes, I had a hard time cropping the photos for IG, haha. But I’m so glad you like them! This is one of my all time favorite recipes. I have been craving these from my childhood, but there is nothing like these where I live now. Unfortunately I am not a good baker or cook and I live at altitude (1600m), so this recipe was a bit hard to follow. I am determined to recreated these that look similar to your pictures. I used method 2 for the custard. Next time I think I will substitute vanilla extract, I’ve never dealt with vanilla beans and it was a pain getting the seeds out. The custard came out lumpy, but still tasty. Not sure what “thickening” was supposed to look like during the final heating/stirring of the custard. Did i have too much heat or not enough time at that heat? I had a medium flame on the gas stove for the saucepan and the lumps were forming on the bottom of the pan as I stirred. Left the buns in the oven for about 15 or 16 minutes and they are a little lighter brown than your pictures. Definitely need a much bigger hole for the custard than what I did, the buns rose in the baking and pushed some of the custard off and didn’t leave much room for the icing and coconut. Wish I could send you some pictures so I could get some tips to try again. Hello James! Do you have Norwegian family, since these are nostalgic for you? Or do they exist elsewhere too? Anyway, I’m glad you came to me! But also sorry it didn’t turn out as expected. I’m not that experienced with altitude cooking, all I can think of with the lumpy custard is because eggs are quite sensitive to heat and water boils at different temperatures at different altitudes. To get the vanilla seeds out it’s definitely a lot easier to use a very sharp knife, or else it will be a pain. But using vanilla extract could work too. I am guessing you may have had too much heat for too long, because it has happened to me too if I do that. Using medium heat shouldn’t be too much though, but maybe in high elevation. Thickening looks like in the pre-baked photos, maybe a little thinner as it thickens more when it gets colder. And yes, no problem in making a larger hole, they do tend to rise much and also pushing the custard a little out. I have made these at an altitude of 730 meters, but used option 1 in custard, but there’s still eggs in that custard, and I haven’t noticed a big difference. Anyway, a little surprised that it took 15-16 minutes to get a lighter color. I am guessing you used 230C (446F) degrees? That is pretty high, so they should have gotten that color, so the only things I can think of there is that altitude requires higher temperatures or that your oven generally needs higher temperatures. My old fashioned cabin oven needs much lower temperature than my oven at home, and 230 is what I use here at home, maybe 200 in my cabin. 1. Vanilla Custard: try lower temperature, constantly whisking, and just when it starts to thicken, remove from heat. 2. Baking: maybe increase temperature to 240-250, but keep an eye on the buns. I sincerely hope you try again, because these are one of my absolute favorite things in life! Not much beats a vanilla custard coconut bun and a cup of hot chocolate. Have a great day, James! PS. If you want you could send me the photos (if you had any) on contact@gingerwithspice.com and I could try to give better advice.